A week has passed and that means I only have one week left, so far I haven’t failed my challenge and I hope you’ve been following along. I have so far managed to review and watch 10 Pixar animated shorts, here are the links to my reviews and my current ranking, I hope you enjoy and I do really appreciate it if you’ve been following along. Another three years had passed for Pixar without a short being made but that was once again going to change but this time due to a new creator, Bud Luckey. With Pixar’s last two shorts winning Oscars expectation and pressure was both high but the inventive director and writer didn’t fall too short creating a funny, happy and heart-warming story that’s very lovable. The story follows a young sheep happy and dancing around he has not one care in the world however one day being plucked out and sheered naked he becomes depressed, shy and a laughing-stock and with this the dancing stops. One day a cheerful Jackolope appears spreading his wisdom as well as cheer, he teaches the sheep how to leap around proudly with no shame and with that the sheep cheers up and dances away but more prouder and happier than ever. The story is very lovable and cheery and is simply a work of brilliance from Pixar. Boudin’ is very bold, it has a somewhat simple message that reads its only what’s on the inside that counts cause appearances can easily differ with that in mind it makes the brilliance of the animated short even more brilliant. Pixar hadn’t created a short with a message since Day & Night and I think it was good for them to do so. 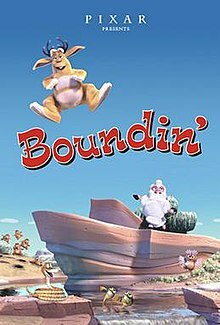 There’s also other reasons Boundin’ stands out from the rest, it has a narrator telling the story in a cheerful rhyme, it’s the first time Pixar included voices and for me it was very successful and a very nice addition. The animation as usual was amazing and so was the storyline and execution however surprisingly Boundin’ didn’t win the academy-award. The short standing at around five minutes is one of my favourites and that’s just due to its cheerful and all round happy feel and lovely message, not to forget about the brilliance on the creative side too. Pixar keep on providing and for me they get better almost each time. Watch Boundin’ here and have your say? Pixar were developing quickly making huge big-selling popular feature films, with their shorts somewhat taking a back seat three years after their last (Knick Knack 1997) it was up to new Ralph Eggleston to buck the trend with “For the Birds”. To say Pixar were developing quickly is somewhat an understatement, the quality, graphics and all round animation is flawless. As always it’s witty, fun and sweet all with that magical Pixar feel making you feel like a child again, that’s if you’re not already one. Ralph Eggleston’s story follows a group of “stuck up” snooty birds sitting on a telephone wire, they mock a recently arrived “goofy” looking bird but get there just desserts in a shocking accident. You find yourself rooting for the goofy bird, feeling sympathetic and when he gets his revenge you laugh and cheer and then of course after realise it’s just a short film. It was Eggleston’s first edition for Pixar and lasted a very entertaining enjoyable three minutes. Being released with Monsters, Inc. a very popular feature it stole some of the headlines winning an Oscar, for Pixar that was two successful wins in the last two attempts. What makes me love For the Birds so much was the way you could relate to the big goofy bird being shunned upon and when karma played its role you couldn’t help but laugh and smile. In a way from the story, quality and characters it is flawless however I do feel there’s an element missing nevertheless its brilliant and simply great. Let me know you views, watch it here.